Liverpool are once again linked with Dutch international and Barcelona star Jasper Cillessen and the latest reports are interesting. According to Sport, the future of the Ajax star is unclear at the Nou Camp. It is mentioned that Barca are satisfied with his performance but would be happy to get rid of him for a fee worth €30million. The Spanish outlet have mentioned that the Catalan giants are still waiting for an alleged Liverpool offer and after that, the future of the player will be decided. The 29-year-old goalie has been a bench warmer at the club for the past two seasons. In the last campaign, he started every game in the Copa Del Rey for Barca but played just one game in the CL and one in the league. Ter Stegen is the first choice goalie under the management of Valverde and in such a scenario, Cillesen needs to exit the club this summer for regular first team football. Liverpool have inconsistent goal keepers like Simon Mignolet and Loris Karius. The Belgian international was signed by Brendan Rodgers to replace Reina and he has regularly leaked goals over the years. German international Karius was signed by Klopp two years ago and his CL final horror story is still fresh in the minds of the Anfield faithful. Without a top class goalie, the Reds would not be able to win the Premier League title. Liverpool need a new goalie and Cillessen needs a new club. The experienced GK was part of the Netherlands squad that won the Bronze medal at the 2014 FIFA World Cup and he only conceded 3 goals in 11 games for Barca last season. 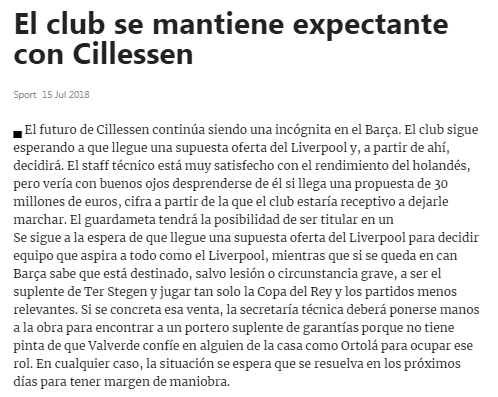 If the Reds fail to sign Alisson then they should move to hire the services of Cillessen.